Three cheers for Starting Over. My eyes flew open at 4:30 this morning with a single, panicked thought. Cold water down my neck could not have woken me more rudely than this particular thought did on this particular morning. What insight, you may ask, was vital enough to push my warm and comfy subconscious into a cold and prickly consciousness? Some kind of epiphany, or even just a great idea? No. It was simply the sudden, jarring realization—the kind that comes only in the bald of dawn—that, as a grown person whose life is half over, I never finish anything. I know. It’s not like I woke up with the guilt of a murderer or the regret of an adulteress. And it’s not like I’ve never bemoaned this fact before; what woman doesn’t feel like she can’t finish anything? But for me, this morning and for some reason, the familiar resignation became a frightening revelation, and it was damning. Not in the curse-word sense, but in the literal sense; I felt permanently condemned—to my own lack of discipline, my own mediocrity. I felt guilty. Look at all the good things life had given me. Why couldn’t I make more of them? I lay slumped in bed with these thoughts for far too long, then finally heaved myself up to pull on capris and a tee for the gym. I stumbled to my desk to get my workout sheets (I’m such a nerd, I actually bring them to the gym) and found them missing. (Where could they have gone? Do you see what I’m talking about?) Irritated, I pulled up the website where said workouts were stored so I could print a new sheet, only to find that the site had been changed, and my old workout program–the one I’d zealously committed to completing in twelve weeks—had been replaced with a new, unfamiliar one. I’d spent hours poring over the old workout regime, learning the correct form for each exercise and carefully putting together a routine that would work for me, and now I’d have to start all over since apparently I’d lost the only hard copies I’d made. I had no time to figure out any of this at 5 am, so I headed to the gym and did the best I could from memory, all the while thinking, Here I am–barely started a new exercise program and already quitting it. I proceeded to lift my piddly little weights, grunting out of disgust as much as effort. The morning’s first, brutal thought hung heavy in the rank gym air: I never finish anything. Stretching afterward, I caught sight of myself (okay, stared at myself) in the mirrored gym walls. All I could think was, I should really start dieting again. This notion had barely formed in my head when it was toppled by another one: Why start? You’ll just quit in two weeks. Such self-defeating talk was, in fact, based on a long history of starting and quitting diets within two weeks. Why? Because I never finish anything. Driving home, the lovely summer morning was wasted on me. I could only think darkly of the family meeting I’d called the night before to discuss the “Summer Schedule” I’d written up for the kids. It included things like chores, scripture study, cooking dinner, and extensive reading. (Of course I’d penciled in some Free Time each day, fun mom that I am.) I’d typed the whole thing up in what I felt certain was an attractive and seductive format. As I passed out our Summer Schedule to each family member, even my husband couldn’t repress a grin. “This looks great, Jen. But what will the schedule be for Week Two?” Meaning, of course, that we’d only keep to this schedule for Week One of summer. I put him in his place (and set a good example for my children) with a composed reply. And though I drug my kids through a whole rigmarole of what our “Summer Expectations” would be (which were listed in fine print beneath the Summer Schedule), I knew, of course, that my husband was right. Vacations and sports camps and grandma’s house would, within a week, sabotage my great expectations. At one point during my lecture, I saw my twelve-year old daughter lean over and whisper something to my nine-year old son, upon which they both giggled. “What did you say to him?” I asked her. “Well,” (smirk) “He was bummed about all the chores he was gonna have to do, but I told him not to worry—he would only have to do them for the first week!” With this, the entire family burst into laughter—except me. Because with this, I realized that I haven’t been fooling anybody, all these years. Even my kids knew it: I never finish anything. Pulling into the driveway and walking through the front door, my mind then leapt to my ill-fated e-book, that glorious fantasy of yestermonth. I had it eighty-percent completed as of March, and then we got busy with Spring Break and leaving town and having company in town and church stuff every weekend and leaving town again and more company in town and and more church stuff and Memorial Day and home renovations and opening the pool and cleaning, cleaning, cleaning the house before and after all those visitors and trips and piano recitals and violin recitals and friends for dinner and karate class and scouts and errands, errands, and more errands and in short: I never finished it. Because I never finish anything. And that aborted effort led my mind to another one: I’ve been trying, for years, to become a more consistent, capable blogger. But as soon as I get on a roll, Life comes crashing down and I put off posting and I lose my audience and I have to start all over to get them back again. Because I never finish anything. But I do start over. I start over a lot. Start over. It’s what I do best. Finishing? Not so much. So unlike the jolt of reproach that woke me this morning, here’s a new thought that’s getting me through my day: Whenever I fail to finish something, I can always just start over. ‘Cause see, if I keep starting over—again and again and again—I will, eventually, narrow the gap between Starting Over and Never Finishing. And one day, I’ll have started over so many times that it will become the way of the Middle, not just the Beginning. What used to be How-I-Start will evolve into What-I-Do. And I’ll forget to not finish. Because one day, the Start Overs will swallow up the Never Finishes. The trick, I think, for today and every day, is to feed the fuel of Starting Over and starve the fumes of Never Finishing. Both will exist, but we can choose which one we dump our energies into. 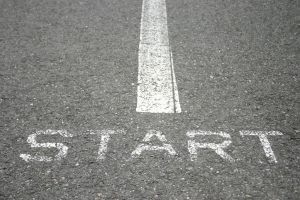 Because though never finishing is not good, I can think of something worse: never starting. 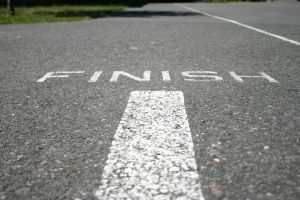 Though never finishing is not good, I can think of something worse: never starting. Next Article First day of school blues. Not.